As the swallows return to Capistrano each Spring so do the Longtails return to Bermuda. The White-tailed Tropicbird (Phaeton lepturus) starts arriving in Bermuda in February with the majority arriving in March. 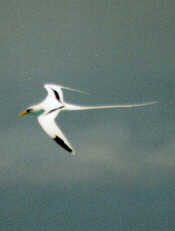 Bermuda is the most northerly breeding habitat for the Longtail. The bird lays a single egg in a hole or crevice in a cliff-face on the sea-shore. Incubation is about thirty days. The chick is fed by both parents a diet of fish and squid. The young birds leave Bermuda in August and the adults leave between October and November. The Young birds instinctively fly southward to spend the next two years. They will then return to Bermuda to mate and raise a chick. I can usually watch ten to fifteen pair from my window. They are active on sunny mornings and head out to sea by noon to feed. As many as three thousand White-tailed Tropicbirds visit Bermuda each year performing their aerial gymnastics over the azure ocean and against the blue skies.